With more than forty years as a published professional designer, illustrator, and mixed-media fine artist, Justin Coopersmith has achieved his signature “visual vibration” series of contemporary paintings. Born in Southern California in 1950, Justin showed early interest in both music and art. After receiving numerous awards, scholarships, and commissions, he wisely chose to concentrate on the visual arts and has never looked back! Earning a degree in Graphic Communication, he continued graduate studies and workshops in painting, sculpture and drawing. After working in advertising design and freelance illustration, Justin moved to Hawaii in the 1970’s with a college partner. He then built a very successful airbrush and screen-printing company. It was in the lush tropical island setting that he was creatively influenced by “Asian” design patterns and rich colors that can be found in his past and current mixed-media paintings. Ready for a cultural change and new challenges, Justin relocated to New York City in the early 1980’s. There he was “discovered” by a major New York print and poster publisher, and signed a lucrative long-term creative agreement. Justin has had more than 200 paintings published in print form as an artist. 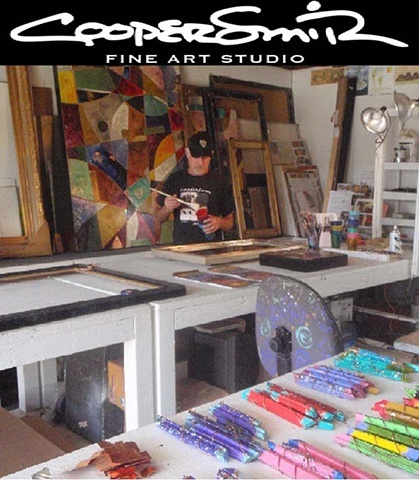 Rapidly becoming one of America’s most prolific fine art print and poster artists, his unique colorful designs and images are reproduced and marketed worldwide along with top-selling licensed products. During the early 1990’s, Justin’s West Coast beginnings drew him back to beautiful San Diego, California where his home and fine art studio are located. Along with his schoolteacher wife and two teenage sons, Justin also enjoys the local North County beaches, golf courses and sports venues. Busy with custom painting commissions and projects, he still travels around the country exhibiting at juried fine art shows. His mixed-media creations can also be found at galleries, public and private collections, and in art publisher catalogs. Abstract expressionistic paintings are his true passion along with landscapes, still lifes, and figurative motifs. His custom shadow-boxed frames create a unique signature look, which adds visual impact to both modern and traditional interiors. My lifelong career as a professional artist formally began with undergraduate and graduate training as a graphic designer and illustrator. I have been greatly influenced by the vibrant colors of Picasso, Kandinsky, Gustav Klimt and Gerhard Richter. Designing and creating mixed-media art enables me to “bring to life” my passion for complex and rich patterns. The juxtaposition of unrelated objects, art mediums, and textures give the viewer an exciting visual experience. Layers of paint, oil pastels, and metallic finishes make a rich palette both contemporary and timeless in nature. Tonal vibrancy, glistening surfaces, and intricate patterns create a dialogue between the images and the observer.